A while back I shared an article on my Facebook page: it reports that non-dairy milks (or ‘drinks’, as they’re legally called) are now more popular than ever in the UK. I remember when, over three years ago, after I decided to eat a plant-based diet I went to the long-life milk aisle in Tesco and could only find one type: Alpro Soya Milk. That was it! Pretty soon other brands appeared and prices became more competitive. And now even in Scotland I am spoiled for choice. The latest ‘milk’ on the market is Oatly, a Swedish brand of oat milk, and one that I have quickly grown fond of. There are heaps of reasons for this: Oatly drinks are GMO free, made in Europe (so kind of more local for me), nut-free and soya-free for any of you allergic people out there, and their marketing is pretty darn cute. (‘Wow, no cow!’) And as they say, ‘It’s like milk, but made for humans.’ That, right there, is why I’m vegan. Cow milk was made for cows, plants were made for animals and people to eat. In the UK they have several flavours available: Original, Organic Original, Chocolate (definitely my favourite) and Chai (haven’t found it in my local Sainsbury’s yet), and of course Organic Creamy Oats. On a Sunday morning after a late night shift I made myself a heavenly Chocolate Oat Milk Frappé with Oatly Chocolate Drink and Oatly Cream. I can’t think of a better way to start the day! I’ve also made myself a simple Amaretto hot chocolate with Oatly chocolate drink: just two ingredients heated in a pan make for a delightful nightcap. Place the frozen bananas, chocolate milk, cashew butter, espresso, cacao and maca powders in a high-speed blender and blend till smooth. Add the ice cubes and blend for a few seconds, until the ice is crushed but still lends some texture to the drink. Pour into a large glass. Add a dash of Oatly Cream, dust with cacao and cinnamon. Enjoy immediately. Using Oatly Organic I prepared this scrumptious lemon sugar crêpe for breakfast. I found the oat milk has a delicate flavour, with a barely perceptible sweetness (even though no sweeteners are used in the formula). 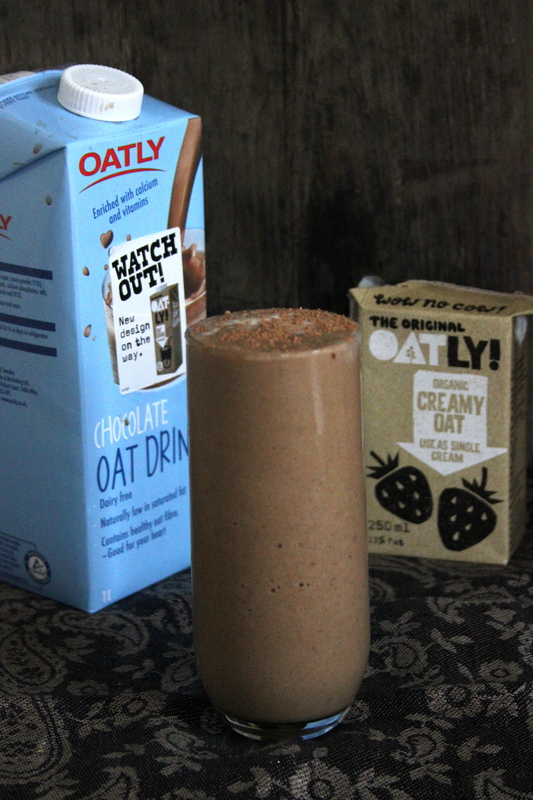 I’ve been using Oatly the Original in my smoothies, porridge and baked goods with great success. It binds ingredients well, has a subtle flavour, and provides a bit of extra fibre too. 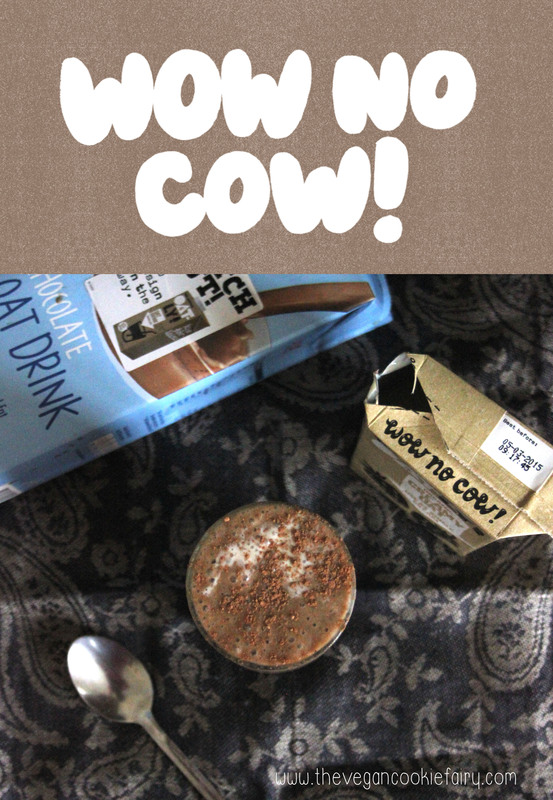 Oatly Cream is one of my favourite new products; if you happen to be intolerant or allergic to soya and/or don’t like coconut cream because of its distinct flavour, you should try Oatly Cream! The non-distinct flavour means it won’t overpower other ingredients in your recipes and similarly binds well. I’ve made an orgasmic amazing mac ‘n cheese using Oatly Cream. All in all I’m really pleased with Oatly products and will definitely be buying them again in the future. The Oat Cream especially because it doesn’t have that distinctive soy flavour that soya cream or coconut cream have. Have you ever tried oat milk before? What have you made with it? Leave me your suggestions below, I’d love to share recipe ideas with you! Disclaimer: I was endorsed for the products reviewed here but as always all opinions are my own. Oat milk rocks. Drink it up. Like what you read here? Let’s keep in touch! Sign up for email updates and follow me on Instagram, Twitter, Facebook, Pinterest and Tumblr! You can also follow my blog through Bloglovin‘. Love oatly so much! I’m more than happy drinking a tall, chilled glass of the original stuff. I’m yet to try the chocolate kind but I’m sure it’s amazing. Oatly yogurt?!! OMG please let them import that here soon. I’d love to try that! I know Elenore from Earthsprout has a recipe from oatgurt but I’ve been too lazy to make much from scratch recently. Vanilla sauce and ice cream too! I hope they start selling it here soon. Chai? CHAI?? Where is it, I want it! I’ve been using Oatly cream for a while now too, I think it’s hands down THE best dairy-free milk/cream substitute going, and excellent for rich savoury dishes as you’ve noted. Chill it thoroughly, and it ‘pipes’ (out of the wee carton hole) much like whipped cream, so you can use it to swirl on top of cold puds – while at room temp it pours nicely for whatever you want it for. Your Frappe looks top notch btw! I know, right?! I was dying to make chai crêpes but with my crazy working schedule at the moment I hadn’t the energy to treck to the nearest Waitrose, which is totally out of my way. I kept my Oatly cream in the fridge but it remained runny – do you mean in a really cold fridge or in the freezer? Waitrose is great for good stuff, they even stock Fry’s vegan slicing sausage and vegan haggis. If Waitrose is out of your way, you can shop online at Ocado, my online shopping basket is full to bursting right now as I do a shop there every few months for things I can’t easily get elswhere. Ooooh. Definitely making a trek to Waitrose for the chai flavour when I get back to University. The chocolate flavour is lovely. Apparently the chai flavour isn’t yet available in the UK, not sure where I got the Waitrose thing from… oops, my mistake. I love Oatly!!!! (That and Alpro Almond Unsweetened are my favourites). I’ve never tried the cream though, must do that next. (Though my third variety of Alpro cream is sitting in the cupboard). I’m not sure ill like the chai one (I’ve never got round to trying chai anything) but i cant wait to give it a go!!!! Apparently the chai one isn’t yet available in the UK – oops, my mistake. But do try the oat cream, it’s great! Reading another comment, i didn’t realise they have a yoghurt too! How cool! Hope that makes the UK/US soon. Oat milk is nice and such a good option for those soy/nut free vegans 🙂 That frap looks yummy! has anyone tried making their own yogurt with oatly?